The Physical Health and Well-being domain of the Early Childhood Instrument (EDI)** includes gross and fine motor skills (e.g., holding a pencil, running on the playground, motor coordination), adequate energy levels for classroom activities, independence in looking after own needs, and daily living skills. 61.8% of all children in the Yukon who are vulnerable in at least one area of the EDI are vulnerable in physical health and well-being. 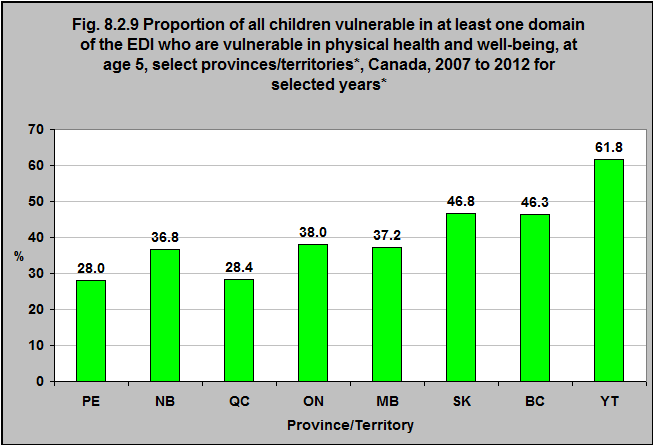 28.0% of the children in Prince Edward Island and Québec who are vulnerable in at least one area of the EDI are vulnerable in physical health and well-being.